Vivo launched its New V5 Dual Sim 4G (Micro Sim + Nano Sim) smartphone with dual standby feature. It has a 5.5 inches touch-screen High Definition display @720P resolution with 267ppi Pixel Density. That makes Images, videos and text will look more sharp and clear on it. This phone is a Dual Sim 4G VoLTE Featured handset which has a Hybrid Sim Slot, that means its second Sim Slot is shared with a MicroSD Card. It may be used either as a Sim slot or a MicroSD slot. You can use this to make calls over 4G network. It is also compatible with Reliance Jio 4G Sim.It has a powerful 64Bit MediaTek MT6750 1.5Ghz OctaCore Processor for faster processing. This Smartphone handset has 4GB of Ram that is coupled with 32GB of inbuilt storage capacity. That allows user to store more songs, videos, photos and install more applications on it. It can be expand upto 128GB of more storage on it via microSD card. 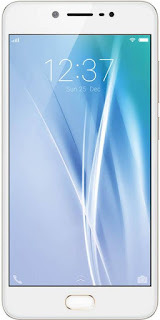 Vivo V5 Smartphone handset runs on Latest Android Operating System Marshmallow v.6.0.1. with a Vivo’s own UI FunTouch 2.6 layer on it. Vivo V5 smartphone equipped with a High resolution 13MP autofocus Primary Camera with LED Flash for taking sharp and clear pictures even in the low light conditions. It also supports Full HD 1080p Video @30fps Recording. Its front camera has features like Professional,HDR,Panorama, Night, PPT, Motion Track, Slow, Fast, Voice Shutter, Touch Capture, Palm, Timer, Gender Detection, Filter, Watermark etc.. This handset has a 20MP Front Camera with F/2.0, 1/2.8” aperture that is also has a LED flash light support to take smooth sharp and crystal clear Selfies in the low light conditions even in the night. And it also enables user to make pretty sharp and clear video-calls through this front camera. Secondary/ front camera has some features like Gender Detection, Night Mode, Voice Shutter, Touch Capture, Palm, Timer, Filter, Watermark etc.. It can record videos @30fps with 2592 x 1944 pixel resolution. For connectivity it supports 2G, 3G & 4G VoLTE network with Wi-Fi, 3G and 4G connection. It also has preinstalled FM Radio, Bluetooth 4.0, Wife – Wi-Fi Hotspot, GPS, GPRS, WAP, Edge, USB Tethering, Mobile Tracker, Instant Messaging, SMS, MMS, Google Maps, 3.5mm Audio Jack and a USB 2.0. It doesn’t support NFC or WiDi feature. 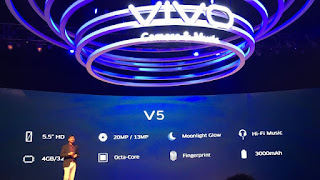 Vivo V5 Smartphone includes sensors like Accelerometer, Ambient Light Sensor, E-Compass Sensor, Fingerprint Sensor, Proximity Sensor but Gyro Sensor is not given in it. It also has OTG compatibility. For power backup it packs a 3000mAh Lithium-ion Batterythat is non-removable. It provides a 9hrs. of talktime approx. 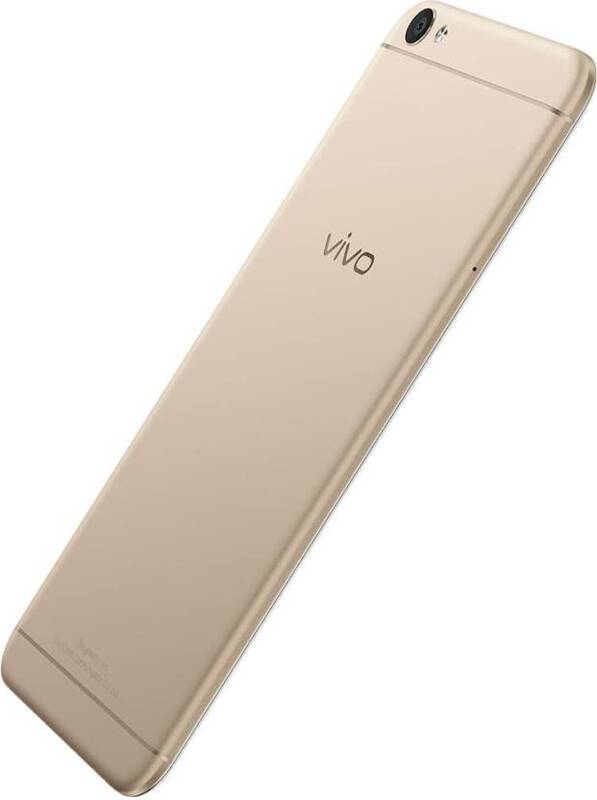 Vivo provides inbox Handset x1, Hands-Free x1, Data Cable x1, Charger x1, Sim Eject Tool x1, Back Cover x1. It measures 153.8mm x 75.5mm x 7.55mm (H x W x T) and it weighs 154 grams. 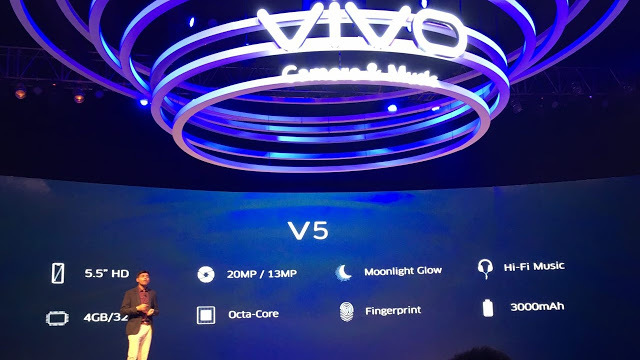 Vivo V5 Smartphone carries One year manufacturer’s warranty on handset and six months on inbox accessories. 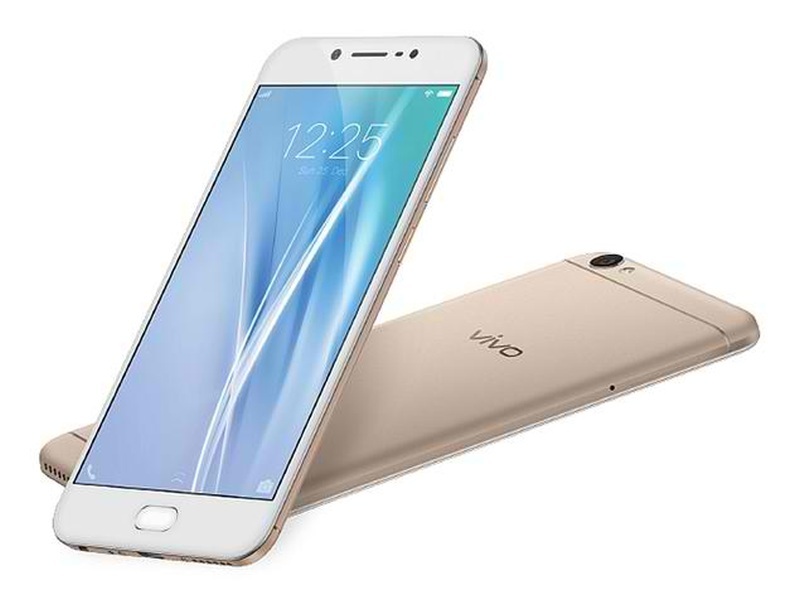 Pros : Vivo V5 is a slim and light weight handset with Decent performance having good front camera qyality in daylight. Its having vivid display and very good battery life in it. Cons : It comes with a Hybrid Sim Slot that may be replaced with a dedicated dual sim slot with additional MicroSD Card Slot. Its Primary Camera is an average camera. Its not having NFC & Gyro-sensor support.